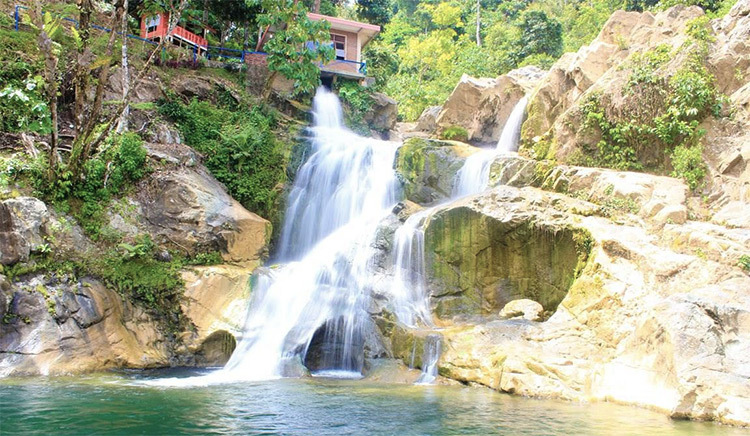 Suhom Waterfall is located in the Suhom village, Lhoong district, Aceh Besar, Aceh province. Another name of Suhom waterfal is Lhoong or Krueng Kala. This waterfall has water source from a hill with a spill of water about 20 meters high. The position of the waterfall is located in the middle of beautiful natural scenery. Around the waterfall, there are many durian trees, when the durian season comes, there will be so many sellers that selling durian around the waterfall. In addition, at this waterfall, there is also a location that can be used for camping. To reach these place, you have to pass through through the route that ups and downs with Paro and Kulu mountain views. Along the way, do not be surprised to see a lot of monkeys hanging around in the street. These monkeys are usually requested fruit or other snacks from those who passing by the street. This 50-meter high waterfall is divided into three levels, but you are not allowed to go up to the two and three level, for safety reasons because of the high-voltage power plants. There is a micro hydro power plant has been built near the waterfall and it operated to supply power to the 200 head of family and residents of Kreung Kala village. Located approximately 75 km west of Banda Aceh or approximately 3 km of the highway between Banda Aceh to Calang, Aceh Jaya; to achieve Suhom waterfall from Banda Aceh, we can use public transport or private vehicles, and takes approximately one hour drive. We can use route from Banda Aceh - Calang (Aceh Jaya), passing Lampuuk Beach, Lhoknga beach and Leupung subdistrict.